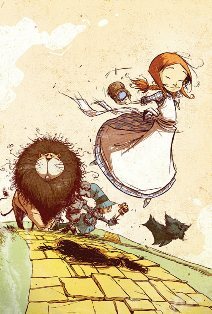 This last week saw the release of not one, but two new series based upon L. Frank Baum’s stories about Dorothy, the Scarecrow, Tip, Jack Pumpkinhead, Glinda, and the rest in the land called Oz. 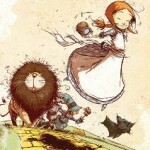 First up is Marvel’s adaptation of The Wonderful Wizard of Oz. Yes, this is the story on which the classic movie was based, but those looking for an adaptation of the movie will be (hopefully pleasantly) surprised. The first issue of this 8-part series takes Dorothy from Kansas to the fateful meeting of the Scarecrow. Written by Eric Shanower (no stranger to Oz, having done some graphic novels in the past), the comic faithfully replicates the whimsical, lighthearted, and innocent storytelling found in the original novel. But the real star of the story is artist Skottie Young, who’s dreamlike drawings suggest a fantastical storybook quality that fits the tale perfectly. I can’t think of any artist better matched to the story than he is. I particularly loved his Scarecrow, and Oz in itself breathes deep with life. Credit must also be given to colorist Jean-Francois Beaulieu, who’s watercolors are bright, vibrant, and breathtaking. Highly recommended. 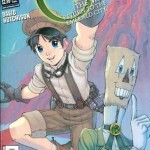 This week’s other tale of Oz is The Land of Oz: The Manga – Return to the Emerald City, which covers the second part of Baum’s second Oz book, The Marvelous Land of Oz. 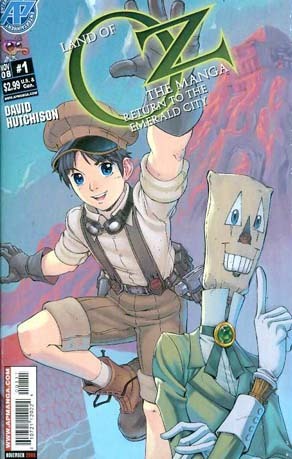 While the manga has different characters, a different tone, and a different feel than Marvel’s adaptation, it is just as successful an adaptation of Baum’s Oz. The Return to the Emerald City is written and drawn in glorious black and white by David Hutchinson for Antarctic Press, and comparing the two series you can really sense that there is a shared setting – that the stories take place in the same universe. This story takes place well after the movie, as Tip and his companions Jack Pumpkinhead, Mr. H.M. Woggle-bug, Sawhorse, and Nick Chopper (The Tin Woodman) help the Scarecrow in his struggle against Queen Jinjur and the witch Mombi. It’s a fun, farcical tale of misfortunes that make a great read. Between the two I have to give the edge to Marvel’s version simply due to the outstanding art, but both make an excellent diversion to a land that has fascinated us for generations.